Shamrock Rose, seizing the lead shortly after the start, shrugged off a sustained challenge from Avie’s Mineshaft and rolled to a 4 1/2 length win in Saturday’s $100,000 La Lorgnette Stakes at Woodbine Racetrack. The La Lorgnette, a 1 1/16 mile race for three-year-old fillies, attracted a field of 10 and Shamrock Rose was the 5-2 favourite as one of three Mark Casse-trained entrants along with Miss Mo Mentum and Hanalei Moon. Shamrock Rose cut out all the fractions in the La Lorgnette, getting the quarter in :24.98, the half in :49.66, three-quarters in 1:14.10, and the mile in 1:38.07 before stopping the clock in 1:44.37. Avie’s Mineshaft, coming off a victory in the Wonder Where Stakes on the turf course, dogged Shamrock Rose from midway down the backstretch to late on the final turn before coming up empty. Miss Mo Mentum, winner of the Grade 3 Selene Stakes here in May, loomed into contention with a four-wide move turning for home but was no match for her stablemate through the stretch run while running on well for second money. Cosmic Love, sent off at 18-1 and making her first start in Canada after joining the Roger Attfield stable just recently, rallied nicely for third money, three-quarters of a length behind the runner-up. A. A. Azula’s Arch, the 4-1 third favourite, was within striking range just behind horses and ran on for fourth money, another neck back. Hanalei Moon, the third member of the Casse trio, was well-placed around the final turn but weakened to finish fifth. Completing the order of finish were Ladies Night, Cascanueces, Avie’s Mineshaft, Peach of a Gal and Time to Play. Shamrock Rose, bred in Pennsylvania by Best A Luck Farm LLC, won the six-furlong Ontario Debutante in her first lifetime start here last September and was returning to Woodbine off a romping victory in the one-mile Malvern Rose at Presque Isle Downs. The daughter of First Dude races for Conrad Farms, the nom-du-course of Manfred and Penny Conrad. The stakes win was the meet-leading 15th for Casse and the third for Lermyte, who also rode Shamrock Rose in Pennsylvania. Shamrock Rose paid $7.20, $4.10 and $3.60. She combined with Miss Mo Mentum ($6.20, $5.10) for a $2 exacta worth $54.90. Cosmic Love ($9.90) completed the trifecta, which paid $435.90 for a $1 ticket, and A. A. Azula’s Arch rounded out the superfecta, worth $1,941.10 for a $1 ticket. 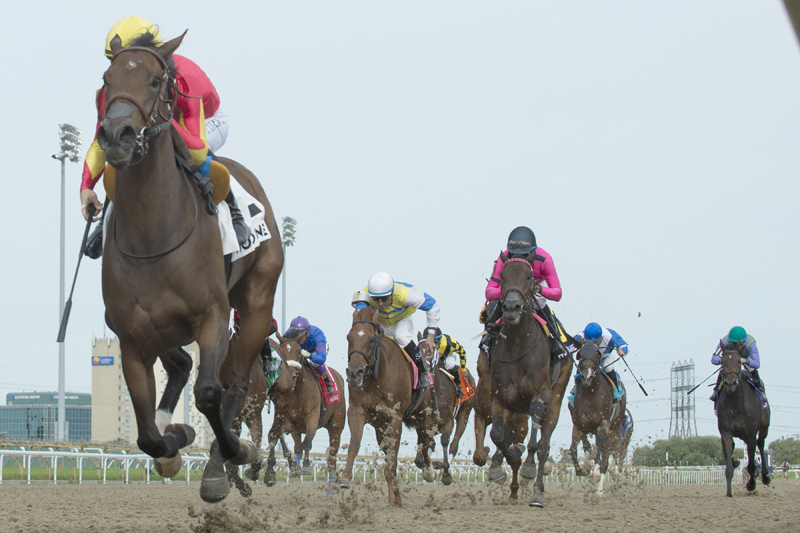 Live Thoroughbred racing continues at Woodbine on Sunday afternoon, featuring the $100,000 Belle Mahone Stakes and the $50,000 third leg of the Turf Endurance Series. First race post time is 1 p.m.